Transport is the backbone and lifeline of our economy. In India, perhaps transport is the biggest business but at the same time it is the most unprofessional & unorganized business also. Challenges are never ending situation for transport industry. The biggest challenge faced by the transporters is that young generation of existing transport employees and owners does not want to join their parent’s industry. The young generation wants to do something different rather than following their parent’s business. Even existing truck drivers are also leaving this industry and slowly moving to bus driving or local driving because of stable income, safety & comfort. The lorry/truck drivers have also suffered from another crucial issue regarding highway robberies. The material is not safe on highway. In some cases, robbers even snatched the lorry from drivers and their locations are not identified till date. Recently five Lorries were hijacked on Maharashtra route and nobody knows what happened to the Lorries and their drivers. Another big issue is that there is lack of awareness among transporters and truckers. There are so many significant areas where the transporter and truckers should be educated. Many transporters even don’t know how to calculate operating cost. They are still following traditional theory of working at an operating cost a bit lower than their nearby competitor. This all leads to reduction in profits of transporters and huge loss to the truckers as they do not acquire the freight rate equals to actual cost they spent. The recent enormous hike in diesel price has created a big problem for the transporters as well as truck owners in the country. The truck/lorry operators find it difficult to manage with the abnormal hike in the fuel prices. is also working for the modernisation of transport industry and for the welfare of transporters as well as truck drivers. Oh that was pitty to know truckers face problems lacking assistance services like repairs, food etc. and owner of truck the main reason behind it”we all know every family or parents have own ambition my child became a doctor,pilot,teacher etc.butnot want driver” driver bring apple to Kashmir and Himachal in his truck, mausami to Andhra etc in our life in every field all work done by truck. All says in India farmers is the backbone so what is driver? Driver is the legs or feet without its we cannot move.all knew it but no body give respect truck driver why this time I m write message this phone company made phone but driver brought it company to market. The main problem truck driver daily faces all days Kashmir to kaniyakumari India is one but no.every state,every teh,every district police R.T.O M.B.I. T.I. Want money as a entry mean truck going own area so what should we do. 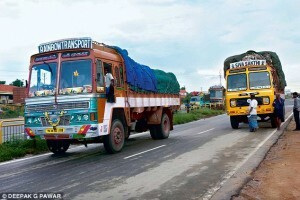 For truck drivers no any facilities provide by government indian driver life so cretical. indian truckers called by the name “USTAAD ” . the respectable name . we also work to uplift drivers life . so trucksuvidha team starts sarthisuvidha to aware drivers about rules and information about trucking . thanks for share your thoughts . Hi, Mr. Dhiman Here we going to find out the solution for the problems facing by drivers and transporter as well by the help of technology. Hopefully you make some help.